The Agony Of The Heat The heat wave suffocating much of the U.S. has set more than 1,000 record temperatures as it moves east across the country. The National Weather Service said more than 30 states and the District of Columbia were under excessive-heat warnings or heat advisories. Hanna Hammond, 4, plays at the public sprayground at Memorial Park on Thursday in Oklahoma City, Okla. Bathers beat the midday heat at the Devil's Pool in Wissahickon Valley Park on Wednesday in Philadelphia. Angela Provis and her daughter Olivia Provis, 6, shield themselves from the afternoon sun while waiting for a bus Thursday in St. Louis. 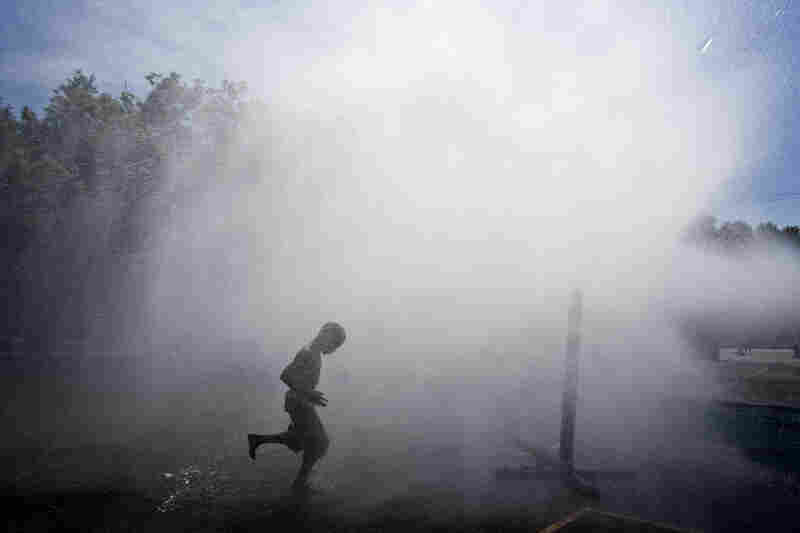 Jayson Hamler runs under a spray of water outside a school on Wednesday in Milwaukee. A member of the Salina South High School soccer team works out early Wednesday in Salina, Kan.
A dog takes an early morning dip on the shore of Lake Michigan on Wednesday in Chicago. 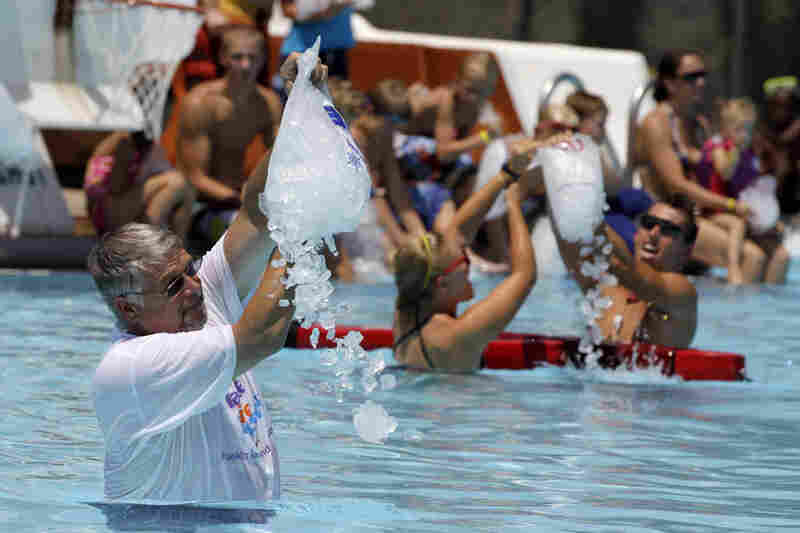 Franklin, Ind., Mayor Fred Paris pours one of 250 bags of ice into the Franklin Memorial Swimming Pool on Thursday. 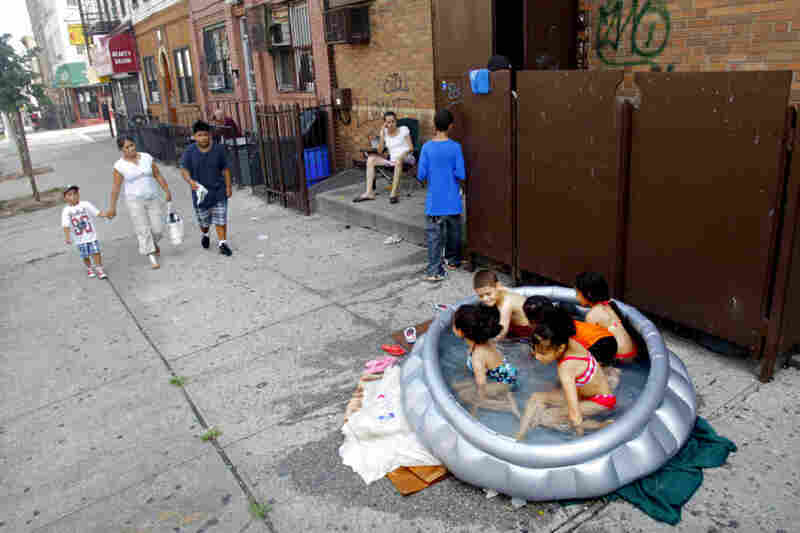 Stephanie Gracia (center) watches as her children and their friends cool off in an inflatable pool outside their apartment Thursday in Brooklyn. 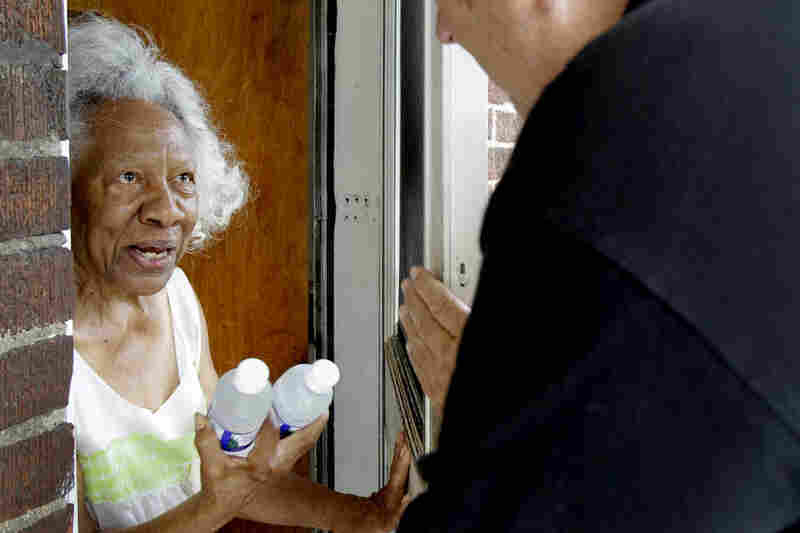 Lillie Walker, 90, accepts bottles of cold water on Monday in Jennings, Mo. 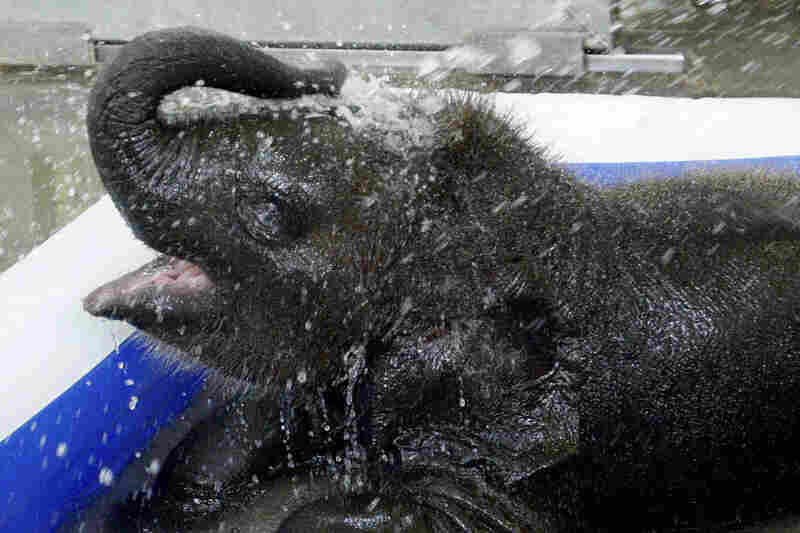 Malee, a 3-month-old Asian elephant, sprays herself with water in her wading pool at the Oklahoma City Zoo on Monday. 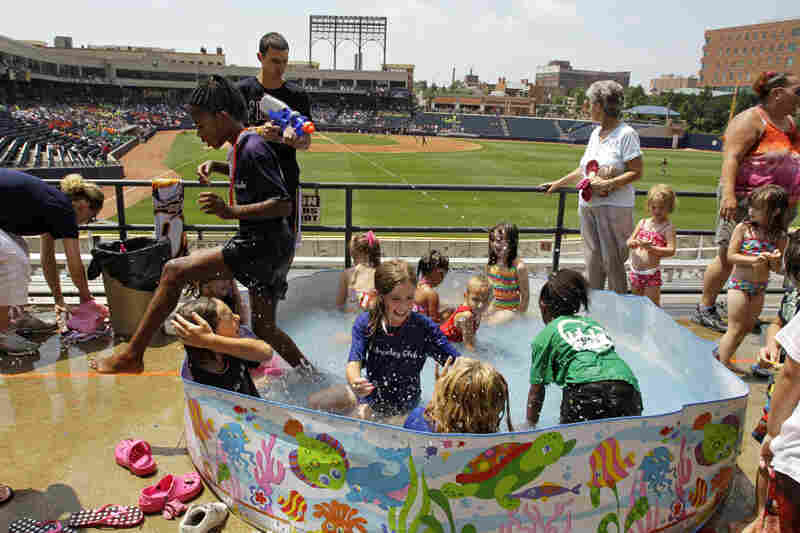 Children keep cool in a swimming pool in right field at Canal Park in Akron, Ohio, on Wednesday. A heat wave has brought temperatures well into the 90s and even beyond 100 for half the country, as seen in this heat map from NOAA. 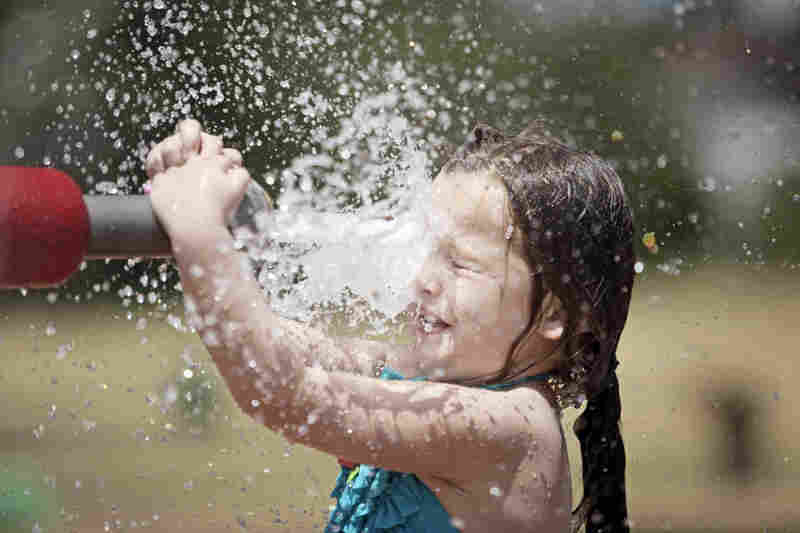 The eastern U.S. felt the full, blazing brunt Thursday of a heat wave that began in the Plains and has strained tempers and electricity grids from Tulsa to Boston amid record temperatures and stifling humidity. "So far this month we've seen more than 1,000 record highs set across the country," National Weather Service spokesman Chris Vaccaro told NPR. 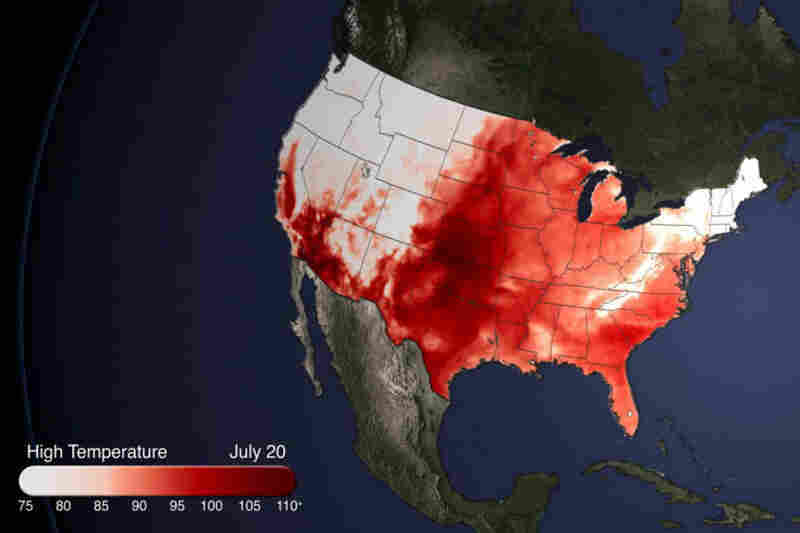 "This is going to be one of the more significant heat waves in the last five years." 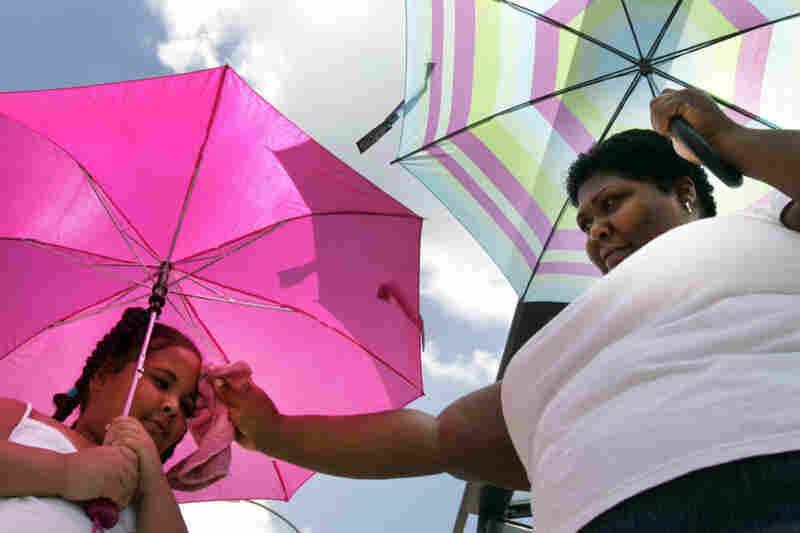 At least 22 people have died so far from heat-related illnesses, officials said. 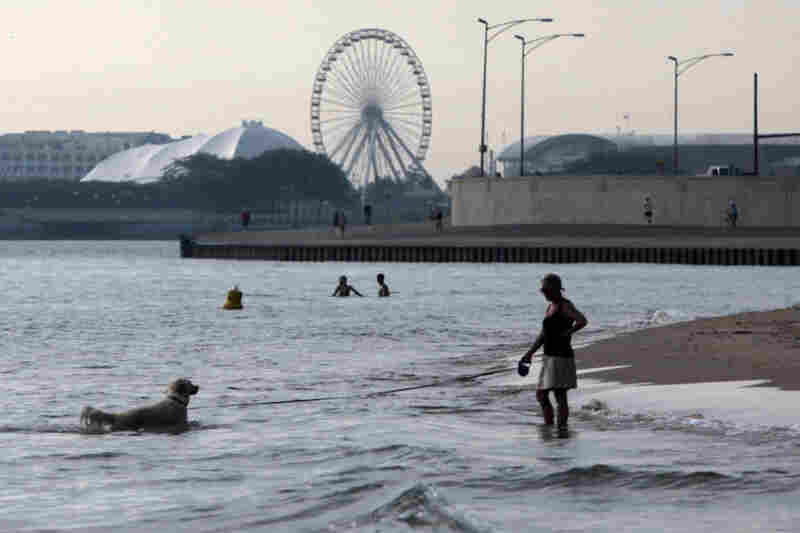 The weather service said Thursday that 32 states and the District of Columbia were under either excessive-heat warnings or heat advisories as a result of a "heat dome" formed by a massive high-pressure area that has trapped and compressed hot, moist air beneath it. "That's not unusual — what is unusual is the strength and duration of this one," said Eli Jacks, a National Weather Service meteorologist. "What is really striking is the humidity; it is exceptionally high." Washington, D.C., and Philadelphia braced for three days of 100-degree temperatures — with heat indexes, a measure that also includes humidity, reaching as high as 116 degrees. Richmond, Va., could see a heat index of 118 on Friday. South Carolina was anticipating a heat index of 115. But the typically more temperate upper Midwest challenged records and resources, as well. It could feel as hot as 115 degrees across Ohio, too. Toledo was likely to shatter a high temperature record set in 1930. — Drink plenty of water. — Avoid alcoholic and caffeinated beverages. — Stay in air conditioned places as much as possible. — Stay out of the sun. — Don't take salt tablets "unless specified by a physician." Many of the same cities that saw record or near-record temperatures last summer could see those records smashed. 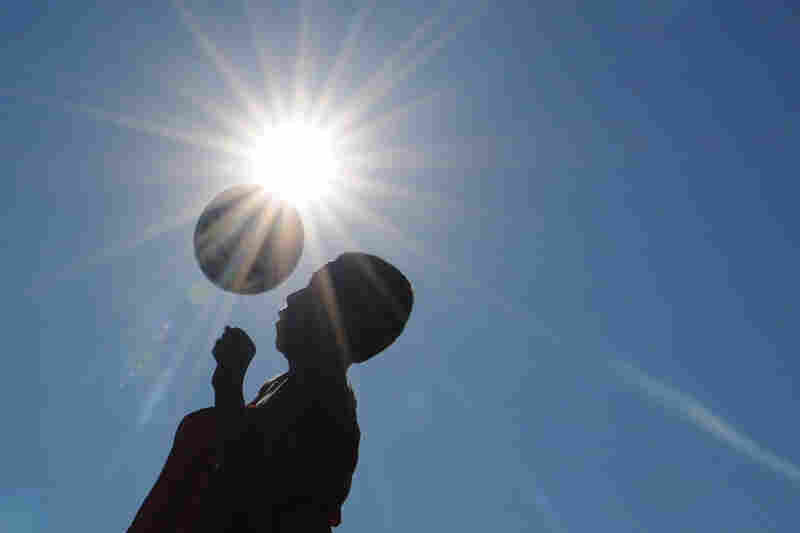 But the brutal heat was a surprise in places such as Moorhead, Minn., where the heat index reached 134 on Tuesday, demolishing the previous record of 124 set in 1966. In Newton, Iowa, where the heat index peaked at 126 on Tuesday, Mayor Charles Allen said the town was taking precautions "to make sure older people can cope with the heat." That's not unusual, he said, but usually such measures aren't needed until August. "We didn't really know how bad it was until they all started reporting on our heat index here," Allen told NPR. "I'm guessing that the heat index will be in the low 100s today." The Salvation Army set up shelters around Newton to provide some relief, and residents looked to possible thunderstorms to cool things down. At a construction site in Kansas City, Tony Gutierrez, was not complaining. "You get used to it," he said. "Just got to go with the flow. Can't make any money at home." Kloesel says forecasters are looking far ahead and far afield for some sign of a break in the heat, scanning weather patterns for storms developing in the Atlantic or Pacific oceans. That, he says, is desperation. And he's doesn't see a change in the weather pattern for months. The upper Midwest was forecast to get a little relief Thursday as the heat dome moves east, and a cold front was expected to begin pushing down temperatures in the North and East by early next week. But Central and Southern states will continue to swelter at least through Wednesday, according to the National Weather Service. 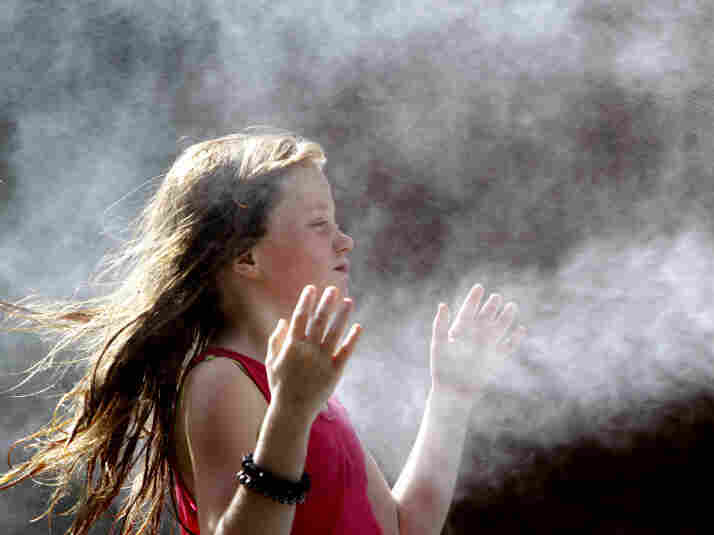 Leena Allen, 9, tries to beat the miserable heat by standing in front of a misting fan during a visit to the Saint Louis Zoo in St. Louis, Mo. Forecasters said the massive heat wave has lasted longer than most and is spread over an unusually wide area. To meet electrical demand, utilities are firing up special power plants used only a few days a year and delaying scheduled maintenance in order to keep all equipment online. They are also keeping watch on heat-sensitive switches and other equipment, testing them with high-tech devices such as thermographers that can gauge temperatures to one-tenth of a degree. Stephanie Johnson of the Jasper County, Ind., Rural Electric Membership Corp. said the local grid was getting a little strained. "Demand is high, and we have enough power now for our members, but we're hoping that stays in force," she told member station WBAA in West Lafayette, Ind. Johnson said customers — especially businesses — need to start conserving energy by turning the air conditioning down to 78 degrees and using fans. Problems can arise when the power grid comes under maximum strain. Equipment can't cool off, and it can't handle as much power as usual. Lines, transformers and switches are working at full capacity and can be overwhelmed by power surges that can result from a blown piece of equipment or downed power line. In Minneapolis, officials at Hennepin County Medical Center said they had treated 18 people for heat injuries since Monday. "When it gets this hot, you will sweat, you will lose volume, you lose electrolytes," Dr. Douglas Brunette told Minnesota Public Radio. "Eventually you can definitely get into heat illness-related problems." The most serious condition is heat stroke, which can cause nausea, low blood pressure and confusion, Brunette said. "That truly is a medical emergency," he said. "Those patients need to be rapidly cooled or they can suffer irreparable damage" or die. University of Minnesota meteorologist Mark Seeley said the number of days with temperatures in the high 90s or 100s hasn't really increased, but the amount of days with soaring humidity have. "We have had far more dew point-driven heat waves in recent decades than any time in the past," he said. It's been at least 12 years since Minnesota has seen such heat indexes, day after day, like those this week, he said. Texas and the southern Plains states will also extend a long streak of hot weather. On Wednesday, Oklahoma saw its 30th day of triple-digit temperatures this year, compounding a drought in western Oklahoma that has dried up lake beds and creeks. In Oklahoma City, three men with Action Safety Supply Co. were repairing a road barrier at a major interstate junction as the sun beat down on them. "If someone's starting to lag way behind, you can tell something's just not right about them," Rocky Webb, a division manager for the company, told member station KOSU. Webb said his crews drink plenty of liquids, take frequent breaks and most importantly keep an eye on each other. Temperatures in the city were expected be as high as 105 through Monday. Kevin Kloesel of the Oklahoma Climatological Survey says it's already one for the record books in the state. "The July 2011 temperatures here in the Oklahoma city metropolitan area are running currently warmer than our all-time hottest month here in Oklahoma, which was August of 1936," he said. With reporting from Frank Morris of KCUR, Jessica Mador and Brandt Williams of Minnesota Public Radio, Michael Cross of KOSU in Oklahoma City, Okla., and Mike Loizzo of WBAA in West Lafayette, Ind. Material from The Associated Press was used in this story.